It is finally warming up here today, so I am breaking out the summer fragrances. Ô de Lancôme was created by perfumer Robert Gonnon and introduced in 1969, and reformulated in 1994. It is a classic Eau Fraîche, with notes of mandarin, lemon, bergamot, jasmine, rosemary, basil, honeysuckle, sandalwood, vetiver, and oakmoss. Ô de Lancôme is classified as a fresh citrus chypre. The top notes are very sharp citrus, with a diffusive quality that makes me suspect that there is a touch of aldehydes. It calms to a crisp, leafy-green citrus with herbal notes and quite a bit of oakmoss. It gets a bit darker and woodier as it dries down. It is light and summery but has good lasting power (for an Eau Fraîche, mind you). It is nicely done, but I do not like it as well as other fragrances in the same category, such as Eau de Guerlain and Chanel Cristalle Eau de Toilette. Ô de Lancôme smells comparatively flat to me after about 30 minutes. It is marketed as a feminine fragrance, but it is no more feminine than any of the unisex scents on the market. Despite that, in 1996 Lancôme introduced Ô Pour Homme, which I have never tested, and which I believe has been discontinued. 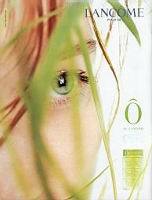 There was also at one time an Ô Intense, and Lancome still produces Ô Oui, which I have also never smelled. It is described as a sparkling floral. Ô de Lancôme qualifies for the "cheap thrills" category only if you shop carefully. At the moment, a 2.5 oz at scentiments is $24.38. I will not post again until Monday, have a great weekend! Thanks for the review! I tried this fragrance a while ago, and while it is very refreshing, I find the top notes too sharp. However, I find it difficult to wear citrus fragrances, by and large, therefore it is not surprising. Ô Oui is your typical fruity floral. I used to wear it long time ago and got more compliments on it than I do on any of my current favourites. I suspect that it is because it has a strong sillage. It is not badly done, however I just do not like it anymore. V, I love citrus — but the first time I sprayed this on a card and took a smell I almost passed out. It is STRONG in the first few minutes. Fruity-floral is less of a favorite category but I should try the Ô Oui. Yes, agree with all of that…especially Lancome's demographic. Men probably don't wander over to the Lancome counter in huge numbers. Despite that, I would guess a fair number of men have worn this since it was first released. Dear R, I bought a bottle of this a decade ago, and only used up 1/5th of it, because it was too biting, even on the hottest summer day, but the dry-down is nice. I think Cristalle is the best women's perfume in the citrus category, but I prefer to wear JM's Verbenas of Provence. Have you ever tried Alpona, which is the first Caron hesperide? Ack — then its no doubt too sharp for my age! No, I haven't — Alpona is on my “get a sample” list but I haven't yet. I had assumed, just because it was Caron, that it would be darker than the others we're talking about. Can you describe it? I haven't tried it yet either, because when I go to the Caron store, there is not enough space on my wrists. I was thinking of stopping by there tomorrow to check it out. Yes, it's probably closer to a chypre than these various citrus eaux. LOL! Have a super weekend! My bottle of this is so old it must be pre-reformulation. It's always been my go-to scent on the hottest, most humid days, and I actually get compliments on it! The hedione (fake jasmine) in it dries down to a soft floral scent on my skin. Let me know how it is if you get to Caron! I hear it is wonderful. Hey, if you ever try the new one, do let me know how much it has changed. I guess I'm opposed to reformulation on principle too, although it beats having the fragrance discontinued altogether. Congrats! It is hard to remember life before ebay, LOL! Thanks for the great description. Sounds like I might need Alpona! And Vetiver Tonka is fabulous. And no — didn't know about Vol de Nuit. Did you try Bergdorf's? Their Guerlain counter is better than most. I just called BG and they have it, so I'm picking it up on the way home. Thanks for the tip! Mwah! Yay, so glad you scored a bottle!